Will your emergency lights work when you need them? What are the inspection and maintenance requirements for Emergency Lighting? 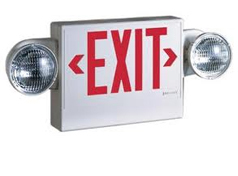 Routine maintenance of emergency and exit lighting is frequently overlooked until an emergency occurs. Regular maintenance is required by NFPA Standard No. 101, chapter 31, section 1.3.7. Our factory trained technicians will perform the required testing and maintenance on emergency lights and provide you with the written records as required by law. Please contact a Fire Solutions NW Representative to get a free quote today!